Did you know employers must submit their injury data to OSHA by March 2nd, 2019? Just like taxes, employers are now REQUIRED to submit their injury records with the government on a yearly basis for review. Employers that fail to comply face stiff penalties and trigger more detailed OSHA inspections and audits. For false information, they could even face up to 5 years in prison- Yikes! Agents are winning new business by educating and helping employers with this important compliance issue – gaining access to a plethora of injury data that exposes workers’ comp. overcharges, errors and mistakes—all while never tipping off the incumbent! 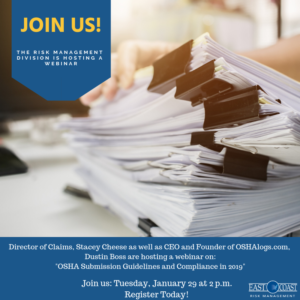 Join the Risk Management Division’s Director of Claims, Stacey Cheese as well as CEO and Founder of OSHAlogs.com, Dustin Boss for a webinar on: January 29, 2019 at 2 p.m. Learn more as they share proven strategies to use safety, OSHA rules, and the workers’ comp. experience mod to outflank the incumbent off-renewal.